Waffles with Draw-ers (Super Thanksgiving Edition): David Gardner – Hey, Look! A Writer Fellow! 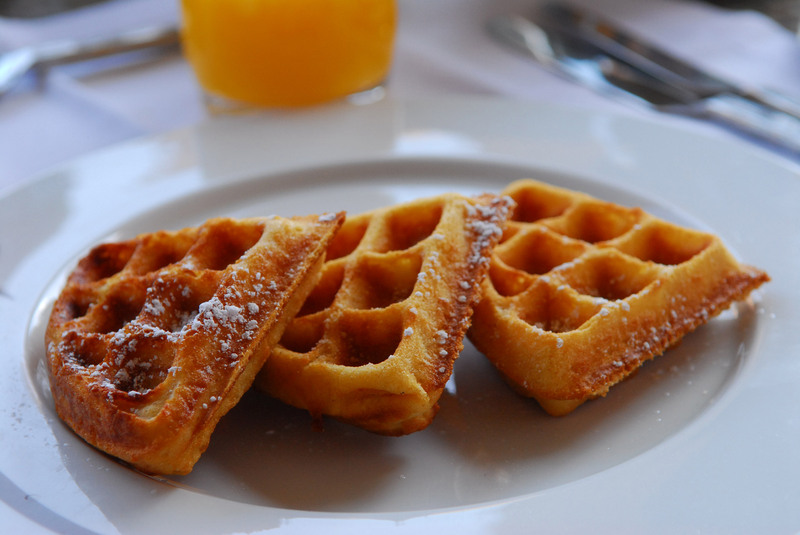 Welcome to the very first installment of Waffles with Draw-ers! Despite David illustrating Sarah Gives Thanks (arguably the one and only Thanksgiving picture book anyone needs), his latest is another Thanksgiving story, which is — gasp! — every bit as good as mine. Rettie and the Ragamuffin Parade (Sleeping Bear Press, 2017) is on sale now. Go buy it! It’s beautiful! David! My old friend! You’re just in time. What would you like on your waffles? Just butter and – oh wow, you’ve got organic butter. And pure Vermont maple syrup! That’ll do just fine, thanks. 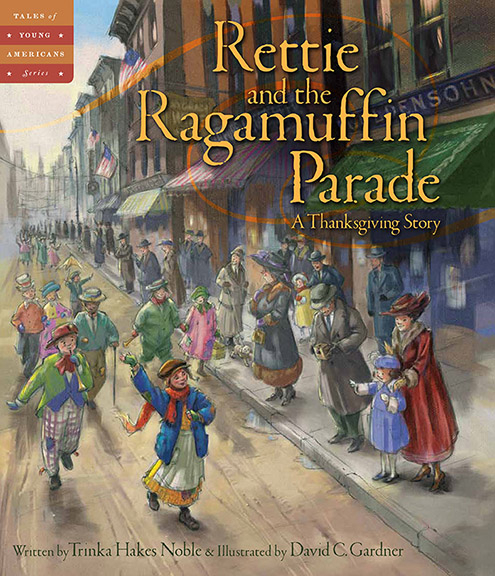 I read Rettie and the Ragamuffin Parade and loved it – even though it is another Thanksgiving story. Are you trying to corner the Thanksgiving picture book market, or what? Weird, huh? Guess I should just be, well, thankful. I do love Thanksgiving, as holidays go. It’s a great concept, right? Just relax, eat green bean casserole, and be grateful. The characters in Rettie are so stunningly realized. Do you use models? Do you ever sneak in portraits of friends and loved ones in your books? For this one, I couldn’t find any girls between 3 and 9-years-old. But I’d been wanting to try a book without models anyway. I didn’t want the characters to look stiff at all. I’ll confess, I’d pose myself or my partner for certain hard-to-draw stuff – like hands. Hands are always tough. I posed myself for that close-up of the nurse comforting Rettie. On my last book, Ticktock Banneker’s Clock, I got lucky and found a fantastic model, a student where I was teaching then, in Santa Fe. But what about friends? If you use friends as models, I’d be happy to pose. You know, if you feel I might be right for a story. I could be a really minor character. A background guy, maybe? Sure, you could be a great all-purpose background guy. But you could be the main character too. Some historical figure.Who would you choose? Lincoln? I like Lincoln. Or I could be a taller, thinner, bearded John Adams? If you squint really hard, I could look just like William Tecumseh Sherman. Um. Maybe… But to answer your question, I would like to fit more friends into these illustrations. My dogs – I fit them in every book. There’s always room for a cute dog in a kids’ book. I have a pet shrimp. How about fitting in a shrimp? Do you include any “Easter eggs” in your books – little inside jokes that only your close friends would appreciate? When I can, but it’s usually something tame like using somebody’s name for a billboard or a brand of laundry soap or something. Maybe I’ll start being more adventurous with that. You recently made a big move from New Mexico to Florida. What is the weirdest thing you’ve seen in The Sunshine State so far? Well, the drivers’ pull off some pretty weird moves. The other day I almost stepped on a huge jellyfish that had washed up on the beach. That was creepy. And they get these tropical rainstorms. A couple weeks ago, I was painting late one night, I got up from my drafting table and flew open the blinds to get some fresh air and this weird bulgy-eyed frog was suctioned to my window, staring back at me with these glowing yellow eyes. I think I left my body. Do you ever look back on one of your published illustrations and see something about it that drives you crazy? An “Oh, I wish I did that differently,” kind of feeling? I do that all of the time. I tend to be a perfectionist. Some are just little things: In The Harvey Milk Story cover, I wish I hadn’t made his nostrils so huge. Mostly they’re paintings I finished and didn’t like. I wish I could’ve done them over, but the deadlines wouldn’t allow it. Is there an illustration of yours that never fails to make you think “Dang! This is amazing!”? I’ll confess I like one in the middle of Sarah Gives Thanks, the close-up of her climbing the stairs with the candle, and the vignettes around her. It really fit my original vision. And the one of her praying, the title page. Oh, I looove the praying one! Sarah Gives Thanks, the praying one. 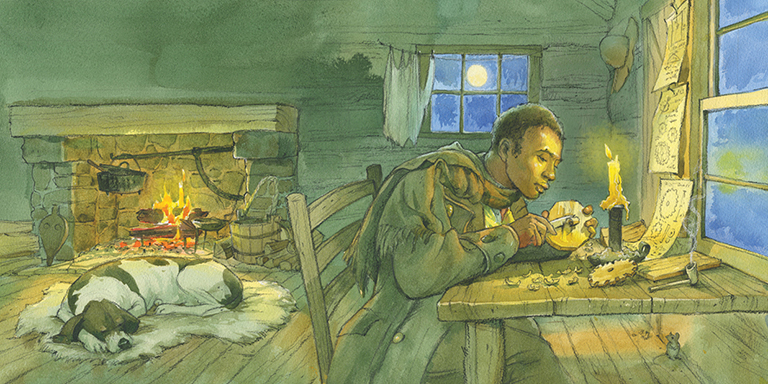 There’s one of Benjamin Banneker working by firelight in Ticktock. Oh – and the magenta, pre-dawn vignette of Rettie mopping the stairs in Rettie and the Ragamuffin Parade. I woke up one morning with that image in my head, that bright magenta and the stairs. That’s cool when that happens, when the vision makes it to the page. It’s rare. You had once worked for Disney Animation, which blows my mind. What projects did you work on? I started there with Rescuers Down Under, then Beauty and the Beast. Later on, I worked on A Goofy Movie and the Lady and the Tramp sequel you’ve probably never heard of. Was there anything about the Disney culture that surprised you? Sure, one thing I wasn’t expecting was there were so many other artists there who, like me, had grown up on Disney, the classics, and they were just as geeky about it all as I was. I had never met anybody else, growing up in Memphis, or even in college, who was a Disney nerd, and suddenly, I was surrounded by them. There was a reverence among a lot of the studio artists for Walt Disney and the old team of artists, as if their spirit was still alive in all of us. We took on the charge of carrying on that legacy. As an illustrator, you’ve ably covered a wide variety of projects. Is there a type of story that you haven’t yet tackled? Shh! Nobody has bought my cow story yet. Thanks for visiting, David! Are you sure you want to return to Florida? Not so sure. I’ve loved visiting with you, Mike, and New Jersey in the fall is lovely. Hey, didn’t you say you guys had a spare room? Why yes, we do! Right this way, good sir. I have come to the conclusion that I need this story about cows to be written. My youngest brother would adore that. As would everyone, because who has not been on a long car ride and had that one person that shouts when there are cows? It’s an amazing phenomena. I will get right on this. What cow story? Are you holding out on me? I knew that tidbit would get a rise out of you. My cow story is a gripping, nonfiction, prison break story. It’s an epic cow vs. man vs. nature story. With a happy ending, of course. And you did notice how many other readers were just as eager for a cow tale? There is an untapped market for bovine aficionados. My cow story was not supposed to be the takeaway of this post, but whatevs. Cows dominate. Just the facts. Then this means we — cow lovers, both — will soon dominate as well, yes? The book looks wonderful. Happy Thanksgiving to you both! Thanks, Carrie! Happy Thanksgiving to you, too. See, David? You could find a lot of stellar models in my comments section. Have a joyous Thanksgiving, my introverted friend! Seriously everyone, what is it about cows that’s got everyone so excited? You know, I’d pay good money to see an all-cow Julius Caesar. I grew up on a farm. Suzie was the cow we could ride on. I miss her. Riding on cows! There should be cow racing instead of horse racing. I’d so gamble on that. Suzie was an awesome Guernsey. And I was 3 when this all happened. Do ya have a photo to share? Hi David! So good to “see” you again. Your drawings – and Mike’s story – sit proudly on my coffee table this time of year – every year. Everyone who visits loves reading Sarah Gives Thanks. It’s become a ‘classic’ in my household. You’re a classic – a nice man who likes organic butter and the ‘real deal’ syrup on his waffles (no frou frou stuff like whipped cream and strawberries) ; you handle Mike’s silly sillies with aplomb; and you draw like the master craftsman that you are. The book looks wonderful. Congrats! Thanks for your kind words, and have a happy Thanksgiving. Well, thank goodness you come out of that cave once in a while to squint at the sunshine and share your amazing work! I feel that I need to remind the world that David exists once in a while, because he is too humble to self-promote. And, well, the guy is awesome sauce. You’re awesome sauce, too, Pam. Have a joyous Thanksgiving! I wish you a wonderful Thanksgiving. I’m so grateful for our blogging friendship. I’m thankful for our bloggy friendship, too. Have a joyous turkey day. I can’t wait to gobble up your new book when it comes out…. Wonderful interview, Mike and David. Now I want to see Mike’s pet shrimp show up in one of the illustrations, which are stunning, by the way. What a wonderful talent. I think Tornado Boy is just the right age for these books. Happy Thanksgiving! What do you think about the shrimp idea, David? Do any of your upcoming books feature a seafood restaurant? 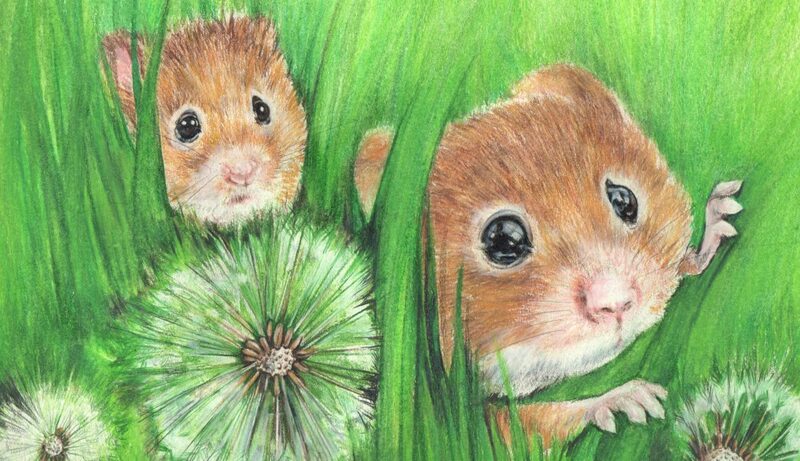 Lovely illustrations – what a talent! If you ever need to paint a googley eyed frog, David, it sounds like you won’t need a model because the one that visited you is etched in your mind’s eye forever. Happy Thanksgiving! Hmm. I should write a googly-eyed frog story to get the ball rolling. Great idea, Shallow! And Happy Thanksgiving! Yes, you definitely should do that! Rettie and Ragamuffin Parade sounds like a great piece of historical fiction! I didn’t know about this incident. Kudos to David for writing and illustrating such a meaningful story. I love all of the historical pieces that authors are sharing. Will definitely check it out. You guys make a good team! Happy Thanksgiving! I think David and I make a good team, too. Here’s hoping he and I will be able to work together again soon! Here’s hoping you had a joyous Thanksgiving! What a nice idea, and the illustrations truly are terrific. Aren’t they, though? David is an amazing talent. A good man to know! Great! Tell Random House. Mikey needs a new pair of shoes. Publishers don’t listen to me. If they did, Jilly would have a new pair of shoes. I have a copy of “Rettie” and I highly recommend it!